On Sunday the team all enjoyed releasing Sami the seal pup back into Jersey waters near to where she was rescued back in December. No-one could have forseen that the Jersey British Divers Marine Life Rescue team who helped Sami and watched her swim free would hours later be rescuing another grey seal pup in need at such an unseasonal time of year. The young pup has a number of health problems, a lot of nasal discharge and very underweight for its age so has been in the care of New Era Vets and is currently on route to the GSPCA. From Jersey to Alderney, Vet Nurses to the Guernsey States Vet, GSPCA Volunteers and Staff, La Société Guernesiaise to Alderney Wildlife Trust, Alderney Animal Welfare Society to those interested from the Channel Islands all with a huge range of skills and backgrounds gathered in Guernsey on Saturday. The 22 Channel Islanders all took part in the BDMLR Marine Mammal Medic course held at the GSPCA and Pembroke Bay. 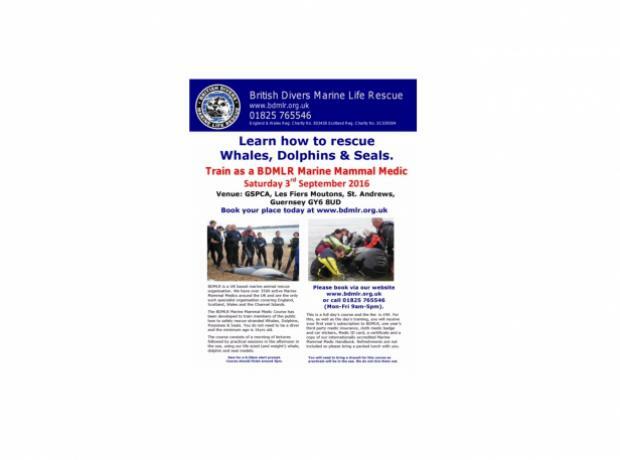 Learn how to rescue Whales, Dolphins & Seals by training as a volunteer Marine Mammal Medic with British Divers Marine Life Rescue on Saturday 3rd September 2016. Stephen Marsh, BDMLR Operations Manager said "BDMLR is a specialist marine animal rescue charity with over 3500 active trained Marine Mammal Medics covering England, Scotland, Wales and the Channel Islands." Learn how to rescue Whales, Dolphins & Seals. BDMLR is a UK based marine animal rescue organisation. They have over 3500 active Marine Mammal Medics around the UK and are the only such specialist organisation covering England, Scotland, Wales and the Channel Islands.